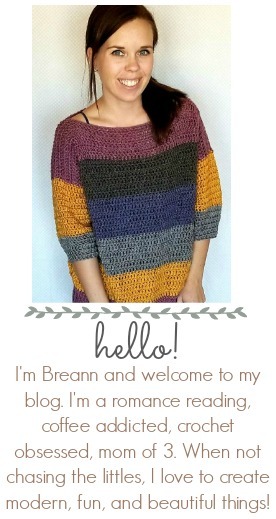 My name is Breann, welcome to my blog! In 2014 I learned to crochet and have been obsessed ever since. I taught myself how to crochet by using free patterns and tips. I’ve recently started designing my own patterns and wanted a place to share them. So here we are! I originally titled my blog Breann’s Stitchery, but soon after I decided I wanted a name that was more of a “catch-all” because I might want to write about more than crochet patterns. Some of my photos still say Breann’s Stitchery from when I first started. I’m a stay at home mom to three little ones. They are 7, 5 and 3. We’re pretty busy around here, but I always find time to pick up my yarn and hook. Although, this is how it looks when I’m trying to crochet more often than not! Prior to being a stay at home mom, I was a teacher for 6 years. While I do miss teaching sometimes, I wouldn’t change where I am right now for anything. I love that I don’t miss a thing with my family. We love exploring and spending time together. In addition to crochet patterns, I want to share some of our traveling and parenting experiences. I’d love to connect with you! You can find me on Facebook, Instagram, and Pinterest!